HR professionals have a hard enough time managing their staff to operate at peak performance. However, finding the right people to fill an open position from the start can help alleviate a lot of trouble later on down the line. One of the key ways to attract the right talent is writing an effective job description. 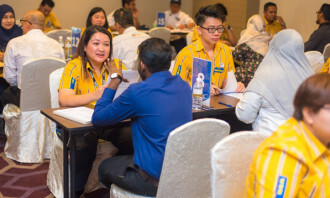 It needs to explain enough about the job that you get the right applicants, but also needs to make the position and your company sound alluring enough to be sure you get any applicants at all. 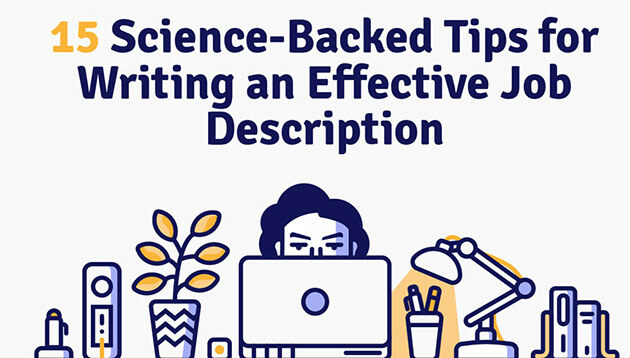 On that note, EBI looked at 15 science-backed tips to answer the question how to write job descriptions – here they are. 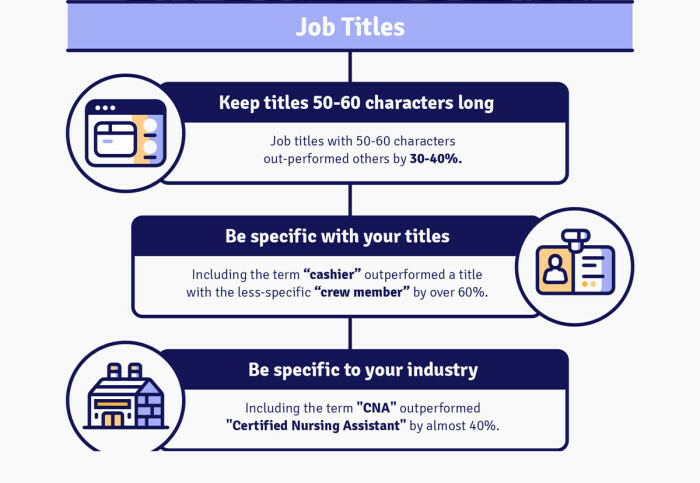 Job titles with 50-60 characters out-performed other by 30% – 40%. Including the term “cashier” outperformed a title with the less-specific “crew member” by over 60%. Including the term “CNA” outperformed “Certified Nursing Assistant” by almost 40%. 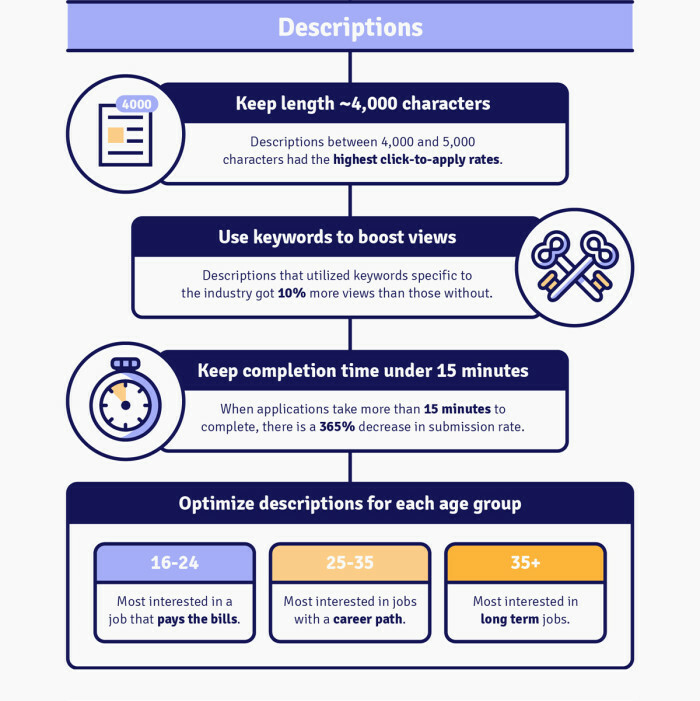 Descriptions between 4,000 and 5,000 characters had the highest click-to-apply rates. Descriptions that utilised keywords specific to the industry got 10% more views that those without. When applications take more than 15 minutes to complete, there is a 365% decrease in submission rate. 24 – 35yo: Most interested in jobs with a career path. Over 35yo: Most interested in long-term jobs. Eye-tracking shows the readers usually skip the bottom section of the description completely. 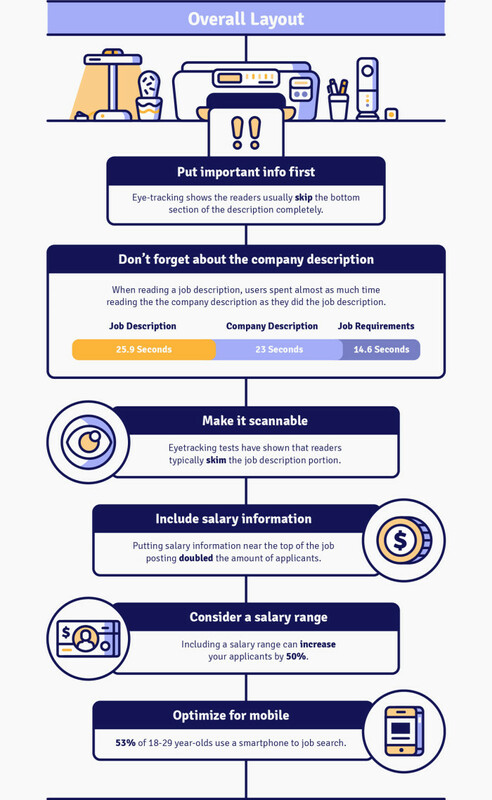 When reading a job description, users spent almost as much time reading the company description as they did the job description. In fact, they spend 25.9s on reading the job description, 23s on company description, and 14.6s on job requirements. Eye-tracking tests have shown that readers typically skim the job description portion. Putting salary information near the top of the job posting double the amount of applicants. Including a salary range can increase your applicants by 50%. 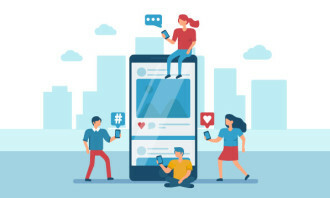 53% of 18 to 29 year olds use a smartphone to job search. Believe it or not, having a swearing culture helps attract talent, build team work and is considered part of workplace culture by ..